Today, we have listed down the best deals Paytm Mall has on flash drives. The products we have found on the platform are from brands like HP, SanDisk, and more. The pen drives are small in size and hence makes easier for us to carry it with us around. 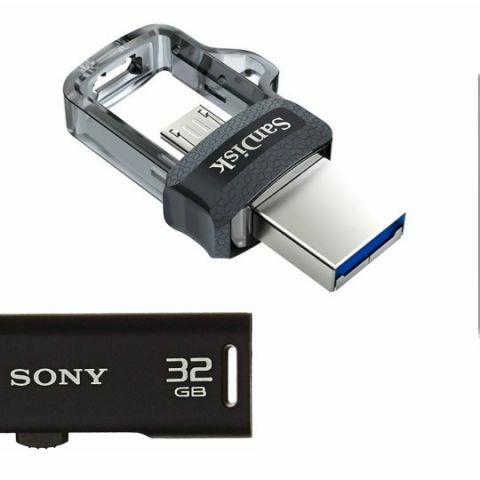 Today, we have handpicked the best deals that Paytm Mall has on flash drives. The platform is offering a great discount and cashback on a plenty of products. Without further adding, let's take a look at it. The SanDisk USB 32GB OTG Pen Drive features a USB 3.0 connectivity. The pen drive comes with dual microUSB and USB 3.0 connector, which allows you to transfer files of your smartphone to PC easily. Click here to buy. If the 32GB pen drive is not enough then the SanDisk 64GB OTG Pen drive might fit the bill. The pen drive offers the same features as the one, which we mentioned above. It also comes with SanDisk memory zone application, which manages the storage of your smartphone automatically. Click here to buy. The HP USB 32GB Flash drive features a USB 3.0 connectivity, which can transfer your data faster than the regular USB 2.0 interface. Users can also password protect their files on USB flash drive to prevent an unauthorized access. Click here to buy. The Sony Micro Vault Classic 32GB Pen Drive features a USB 2.0 interface. The pen drive is compatible with both Windows and Mac OS. The device also sports a retractable design that protects it from unwanted damages. Click here to buy. If even 64GB pen drive is not quite enough to accommodate your data then the SanDisk 128GB will do the job. The pen drive comes with dual microUSB and USB 3.0 connector, which lets you transfer files of your smartphone to computer easily. The SanDisk Memory Zone application, which is available on play store, helps you to manage your smartphone storage effectively. Click here to buy.